I recently told a friend about a 100% remote company I work for, and how it’s great to work with others who understand the nuances of a non-traditional office. The friend started conjecturing about what an all-remote workforce means, describing employees in the same way South Park portrays its World of Warcraft guy — a complete stereotype. Here’s everything traditional 9-5ers need to understand about remote-work life. No, I can’t hang out at the beach. I once had a phone call with a friend that went a little like this:Hey, what are you up to? Oh, perfect! Come to the beach with me! No, no I’m working. I have a meeting in 30 minutes.Working from home means I’m actually working. Most of the time, longer hours than if I were in an office. While sometimes I may be able to sneak in a lunch, coffee, or other get together around meetings and deadlines, I’m going to have to make up those hours later. I’m not glamorously typing away in a coffee shop in a foreign country. Ok, sometimes I’m in a coffee shop (I like to pretend the baristas are my coworkers). And sometimes I’m in a foreign country. And sometimes I’m in a coffee shop in a foreign country.But most of the time, I’m in my home office that looks much like my cubicles have looked like at past jobs (only more spacious and my kitchen is a few steps away). Cafes are often too loud for meetings, and the Wi-Fi isn’t always reliable (and sometimes doesn’t exist). I’m also not typing away in my pajamas. I have actual deadlines. And actual meetings. And an actual paycheck. The concept of remote work is still foreign to a lot of people. In many minds, what I do is a hobby or something to fill the time, but not real work. But, in fact, I’m a real employee on a real team for real companies with a real payroll; the physical location doesn’t matter. What’s important is I get my work done on time.I am getting paid by each one of my clients to produce something, whether that’s a content strategy, a headline, a blog, or any other product. I’m not making up clients or volunteering my time. If I have a meeting at 4 PM on the East Coast, it means, because I live in Germany, I have to be dialing in and ready to go around 9:50 PM. It’s very much real work. Working from Germany for primarily East Coast-companies, my hours aren’t 9-5. And that’s not just because I freelance and can often set my own hours. Many of my clients, while non-traditional in the sense they work with freelancers and remote employees, stick closer to 9-5 hours. While I’m not getting paid by any of them to lock myself to my computer from 9-5, it’s easier to overlap some of that time so I am available for on-the-fly questions.Depending on deadlines and meetings, I may work 9-12, and 3-11 on Monday, 12-4 and 7-10 on Tuesday, and not at all on Wednesday (who am I kidding, that never happens), etc. The hours fluctuate with work and schedules. Planning a social life ahead of time isn’t easy. This one is for my peers who don’t hold full-time jobs or get off of work at 6 and are done for the day. My previously described wonky hours are mostly a product of unknowns. Some of my clients plan ahead of time. For example, I have a 600-word blog post due on August 20. I can plan around that since that date is locked and won’t change.But, with other clients, schedules are more guidelines. A website I’m rewriting is scheduled to begin on September 5, but that’s pending client approval of wireframes so it may not begin until September 10. Another project is due August 3, but we’ll meet with the client the next day to review and they may or may not have changes large or small, which may carry the project into August 4, 5, and beyond. So, while I have a meeting from 6 to 7 PM, I can’t plan dinner because I may have more work after the meeting — I won’t know until after the call. As a freelancer, I don’t have paid time off, so it’s hard to set vacations when client project timelines inevitably bleed into my “off” days. 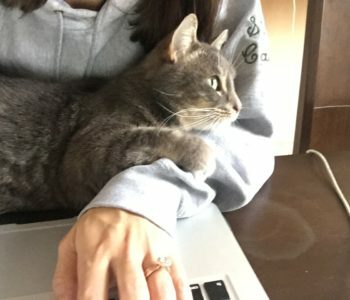 Working remote doesn’t change my job. With my husband’s job moving him anywhere in the world every three or four years, remote work is an essential for me. I miss the social aspect of a traditional workplace, but that just means I work harder and find new ways to form bonds with my colleagues. As a copywriter, I can do my work from anywhere — it’s a matter of finding companies that understand that or are willing to test that promise. It requires extra hustle and adapting to new ways of working, but it’s doable. That’s important to me, should my husband ever lose his job or want to leave. And I like the challenge.Questions about remote working? Leave a comment below! Though my answers will be specific to my experience, I’ll do my best to provide any additional insight into what this non-traditional work life is like.